The historical affinity between the philosophies of Judaism and Islamism is an undisputed fact and a potential key to the building of peace in the Middle East. A common wisdom inspires peaceful coexistence among nations. The highest point in the cooperation among philosophers of both religions took place during the Middle Ages, and the 21st century might be a nice occasion to regain that level of intercultural dialogue. Life is cyclic: new times make old ones be born again. The future policy regarding the Temple Mount, in Jerusalem, might be inspired by the interreligious cooperation that existed during the lives of Averroes and Maimonides. As to peace between Israel and the Palestinians, the traditional divide between “left” and “right” makes no sense any longer in Western countries. It is impossible to reach peace through negotiations with fanatics whose public aim is the destruction of Israel, and whose ideology glorifies death. One also cannot win through military operations only, although these need to be firm. Peace must begin as a cultural and grassroots process. It has to start in the minds. Much has been done along this line that should be better known and more powerfully stimulated. The Middle East needs among other helping factors a philosophy of peace, for this defeats religious fanaticism. And life is paradoxical: side by side with building intercultural views of the world, effective military measures should proceed and possibly get expanded. The growth of Israel and the access of Jews to the Temple Mount must take place hand in hand with building better cross-cultural ties with Arabs. Both are necessary. “Left” parties should realize that a stronger Israel is needed so that a lasting peace can be inaugurated. Military operations are tactic, while the building of rightful relations between the Arab and Jewish worlds is strategic and long term. For peace to be attained, the ideological apparatus now generating worldwide hatred against the Jews – be it from the media, from mosques or the United Nations – must be unmasked and dismantled not only by Israel and its friends, but by the friends of justice and common sense in general. The industry of lies should be destroyed as the Arab-Israeli cooperation gets expanded in a thousand ways. Historical experience shows the potentialities of long-term grassroots dialogue. The seeds of future can be found in the past, and the life of Maimonides teaches lessons to the 21st century. In his classical essay “Averroès et L’Averroïsme”, French philosopher Ernest Renan (1823-1892) examines the cooperation between Muslim and Jewish philosophers during the 10th, 11th and 12th centuries. On several countries and occasions, there was no separation between Arab and Jewish schools of philosophy. In Spain, the Arabs had great tolerance towards Jewish and Christian cultures. The Arabic was the common language shared by Arabs, Christians and Jews alike. Spain constituted a “second homeland” to the Jews. Moses Maimonides, the celebrated Rabbi and philosopher, expressed his personal gratitude to the Arab philosopher Averroes, from whose writings he learned much. Maimonides wrote his “Guide for the Perplexed” in Arabic language. Renan examines the fact that the philosophies of Averroes and Maimonides have much in common, both being influenced by Aristotle, Plato and Neoplatonism. Thanks to Maimonides, Averroes was widely read in Jewish circles. Renan wrote that Jews took Arab philosophers more seriously than the Islamic establishment itself. Many of the works of Arab philosophers were only preserved from destruction thanks to their Hebrew language versions. In difficult times of the Middle Ages, Arab philosophers were as persecuted as the Jews by Islamic fanatics and authorities, and their works, destroyed. But a period of cultural renaissance took place for a few centuries. Émile Bréhier writes in his book “La Philosophie Du Moyen Age” that in the ninth and tenth centuries there was a renaissance of the Jewish philosophy within Arab countries. The majority of the Jewish philosophers wrote in Arabic. The influence of Hellenism inspired a harmonious coexistence and dialogue among Muslims, Jews, Christians, and even atheists, in Bagdad during the 10th century. Al-Hakam II, or Hakam (915-976), the second caliph of Cordoba, in Andalusia, Spain, was a scholar himself and stimulated the various sciences. Émile Bréhier writes about the similarity of Muslim and Jewish philosophies. One of the main Arab philosophers of all time, Al-Farabi (c.870-950), is considered the “Father of Islamic Neoplatonism” and called the “second master” of philosophy in the Arab world, after Aristotle. Another great name of medieval philosophy is Solomon Ibn Gabirol, or Gebirol (1021-1070? ), the Jewish Neoplatonist who paves the way to Rabbi Maimonides. Born in the year 1135 in Córdoba, Spain, Rabbi Moses Maimonides wrote “The Guide for the Perplexed”. Avicenna (980-1036), and Al-Ghazali (1058-1111) combined Neoplatonic and Aristotelian concepts and visions. Avicenna is said to have influenced Maimonides. 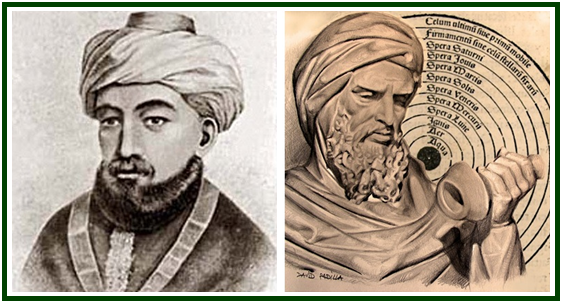 The Platonist-Aristotelian thinker Shihab al-Din al-Suhrawardi (1154–1191), of the Iluminationist (ishraqi) school, has only started to be known in the West in the later part of the 20th century, thanks to the efforts developed by Henry Corbin. The wisdom of the past never dies and can regain force any time if the proper conditions are created. In the 17th century, a Shia Islamic philosopher in Persia, Mulla Sadra (c.1572 – 1640) led the Iranian cultural renaissance and inspired the creation of the school of thought called “Transcendent Theosophy”. Sadra’s main work is “The Transcendent Theosophy in the Four Journeys of the Intellect”. On the Jewish side, it is well-known that the Zohar is a Theosophical work, as Gershom Scholem, for instance, states in his book “Major Trends in Jewish Mysticism” . These are a few evidences, among many, that an inner wisdom exists which is common to Islamic and Jewish philosophers, not to speak of other cultures. Plato was a Pythagorean, and Neoplatonism is often called Theosophy. Alexandria was the birth-place of the Eclectic or Neoplatonist School of Theosophy, which also inspires the modern esoteric philosophy of Helena Blavatsky. In criticizing the cultural limitations of what he called “Semitic race”, Ernest Renan was not singling out the Jews, in any way. He was referring to all nations whose languages are Semitic , and this includes the Arabic, Hebrew, Aramaic, Tigrinya, Phoenician and Maltese languages. Renan defended the Hellenistic pantheism as an alternative to monotheistic narrow-mindedness. He was partially right. Although he couldn’t look in a deeper way to the Semitic nations or understand the depth of the Jewish theosophy, he did point to the right direction. In fact, Israel has no desert-like mentality. The “Neoplatonist pantheism” flourishes in the Jewish ability to turn a desert into an oasis, as has been clearly taking place in Israeli soil since 1948. Besides being valid in itself, Israel’s agricultural victories are a metaphor and a symbol of Israel as a garden, a planetary garden whose diversity is cultural, religious, philosophical and ecological. For centuries, the diversity of views has been a healthy hallmark of Jewishness, so that the danger of the “desert religion” is not difficult to put aside. By accepting diversity, nations attain unity, and this is something to do once and again. The historical cooperation between Arab and Jewish philosophers in the Middle Ages can inspire actions in several dimensions of life during the next decades, so that peace may emerge in a lasting way. Two quietly revolutionary steps in that direction are the spread of the study of Arabic language in Jewish primary schools in Israel, and the multiplication of bilingual schools. A third step is called “Bridges for Peace” and promotes friendship between young Arabs and Jews. Other intercultural initiatives take place along the same lines. The renewed spirit of such centuries-old dialogue can enlighten the birth of a new policy towards the Temple Mount, which will be able to finally grant Jews their right to the place. Besides defeating terror, one needs to build peace. Tikkun Olam, the healing of the whole planet, is part of the Jewish duty. In Israel as in other nations, the grassroots Arab-Jewish cooperation will eliminate the foundations of anti-Semitism, of anti-Zionism and Islamic terror. It is going to silently destroy other forms of organized ignorance. Israel is a land of tomorrow: its unlimited potentialities are unfolding right now and helping the world already. “Averroès et L’Averroïsme”, Ernest Renan, Calmann-Lévy, Éditeurs, Paris, 1866, 486 pp. see p. 180. “Averroès et L‘Averroïsme”, Ernest Renan, op. cit. see p. 173. “La Philosophie Du Moyen Age”, Émile Bréhier, Éditions Albin Michel, Paris, 1949, 470 pp., see pp. 101-102. “Averroès et L’Averroïsme”, op. cit., pp. 4-5. “Qabbalah, The Philosophical Writings of Ibn Gebirol, or Avicebron”, by Isaac Myer, 499 pp., Philadelphia, 1888. The book is available at our associated websites. “Collected Writings” of Helena P. Blavatsky, TPH, Volume XI, p. 28. “The Guide for the Perplexed”, Moses Maimonides, Dover Publications, Inc., New York, 1956, 414 pp., see pp. XV-XVI. “Averroès et L’Averroïsme”, op. cit., pp. 1-2. See for instance the book “Sadr al-Din Shirazi and his Transcendent Theosophy”, by Seyyed Hossein Nasr, Imperial Iranian Academy of Philosophy, Tehran, 1978, 108 pp., especially chapter five. “Major Trends in Jewish Mysticism”, Gershom Scholem, Schocken Books, New York, copyright 1946, 1995 edition with 460 pp., see sixth lecture, “The Theosophic Doctrine of the Zohar”, pp. 205-243. See for instance “Judaïsme et Christianisme”, Ernest Renan, Éditions Copernic, Paris, 1977, 176 pp., see pp. 37-54. “Judaïsme et Christianisme”, Ernest Renan, Éditions Copernic, Paris, 1977, 176 pp., see p. 40. Ecclesiastes, 1: 9, see “Tanakh”, The Jewish Publication Society, Philadelphia, Jerusalem, 1985. See the 2016 “Jewish News Online” article “Arabic to be mandatory in Israel’s Jewish primary schools”. Read the 2016 “Jerusalem Post” article entitled “Hundreds of Arab, Israeli children building bridges to peace through tech”. The above article was first published in 2016 in our blog at “The Times of Israel”.